Good morning! How’s your week going so far? Managing people can be an ongoing challenge, but it’s also essential to business success — so I thought today we could talk about employees. Is your company culture a priority, or an afterthought? If your answer is the latter, don’t feel too bad: 64% of employees don’t feel they have a strong company culture, so you’re far from alone. That’s definitely a gap you need to fill, though! One Columbia University study found that a strong company culture can reduce your business’s job turnover by nearly 35%. No matter how good the pay or benefits, we all ultimately want to be happy — and a good culture fit is crucial to happy employees. So how do you create a positive culture in your workplace? What does your business do for people, and why is it important? If your employees can’t answer that question quickly, easily, and consistently, then it’s no wonder that they don’t feel personally invested in their work. It’s important to have a clearly defined mission statement, and to repeat it often. When everyone knows why their work is important, your entire team will be better motivated to overcome challenges. Establishing trust is imperative if you want employees to feel comfortable taking risks, asking questions, and addressing issues. This both means that employees need to trust management, and that management needs to trust employees. Clear communication and consistency are key to building an atmosphere of trust throughout the workplace. Most of all, leaders need to buy into company culture before anyone else will. If you talk the talk but don’t walk the walk, employees will be able to see that your words are empty. Leaders within the company need to hold themselves to the same high standards that they hold their employees to. No matter how good your marketing is, how effective your sales pitch, how streamlined your branding, it’s the employees that make or break a business. 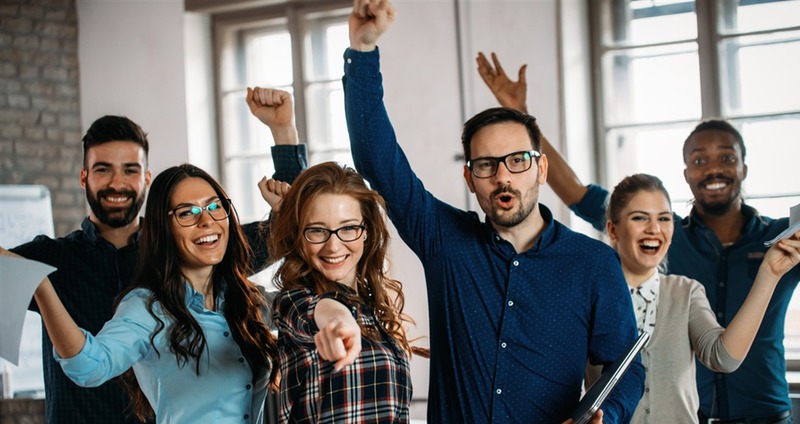 A developed, positive company culture is the secret to ensuring that employees and company leadership stays on the same page, working towards the same goals. Everyone has their own strengths that they bring to the table within a business. However, not everyone is cut out to be an amazing salesperson. Here are a few important traits to look for when putting together an effective sales team. Go-getter — Step one is finding somebody who isn’t afraid to take action. This means someone energetic and passionate, who can channel their enthusiasm into sales day in and day out, even when they’re being told “no.” This also means someone who is confident and assertive. Salespeople can’t be afraid to speak up or take a risk. Finally, this means someone who has ambition and is self-motivated. You can’t hold your sales team’s hands every day! Good with people — Being in sales means you need to be a “people person.” But that doesn’t just mean that you need to be friendly (although that’s certainly a part of it!) It also means you need to be good at asking the right questions and properly interpreting responses. Put-together — An energized, sociable salesperson with no analytical or organizational skills still won’t be successful. You need someone who understands how to organize their time, stay on top of all their leads and prospects, and deliver what they promise. Trustworthy — Of course you want to be able to trust your salespeople, but they also need to be trustworthy through the eyes of the customer. Are they polite and respectful to leads? Are they honest and helpful, so that your product ends up in the hands of the people who actually want and need it? Customers can tell who’s trying to help, and who’s just trying to get the sale. Your product can be incredible, but if you don’t have a good sales team to pitch it, your prospects may never know how incredible it is! When you find team members who are naturally well-suited to sales, their numbers will speak for themselves. Thanks for reading, and have a fantastic week!